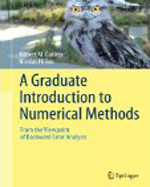 This book provides an extensive introduction to numerical computing from the viewpoint of backward error analysis. The intended audience includes students and researchers in Science, Engineering and Mathematics. The approach taken is somewhat informal owing to the wide variety of backgrounds of the readers, but the central ideas of backward error and sensitivity (conditioning) are systematically emphasized. The book is divided into four parts: Part I provides the background preliminaries including floating-point arithmetic, polynomials and computer evaluation of functions; Part II covers numerical linear algebra; Part III covers interpolation, the FFT and quadrature; and Part IV covers numerical solutions of differential equations including initial-value problems, boundary-value problems, delay differential equations and a brief chapter on partial differential equations. The book contains detailed illustrations, chapter summaries, and numerous examples and ready-to-run codes using Maple.